An outdoor fireplace in the city? Yes. It’s a rare and wonderful amenity, especially when it is done so discreetly. Behold a new outdoor fireplace that will add warmth and light to an otherwise chilly outdoor space. This addition is sure to become a welcoming albeit seasonal entertainment room in this newly renovated home. The wires and bracket mount you can see in the mantle wall above are for a television of course. This flat screen TV will share the brick wall and together with the fireplace they’re sure to be the focal point of this unique outside covered patio. This homes remodeling project saw Keith Travers the builder add this gas burning fireplace unit into the red bricked backside of an existing chimney structure. This alteration of the chimney and the metal fireplace installation required some additional engineering to protect against ‘back puffing’, and sealing around the unit protects against leaks of any kind. Together with the television, the fireplace will get a lot of use. The room has authentic morning peace and serenity and you can hear the birds chirping in the nearby trees. But in the afternoon, and evenings, the family can light the fireplace and relax and watch sports here with friends; this family can have fun outside the house, and yet still be inside out of the wind and rain and near the fire. This is a place where neighbors can gather and communities can meet more informally and more comfortably than they could inside a family home. Similar in construction to an indoor fireplace, the typical outdoor fireplace is usually made to compliment an existing flagstone, brick, or concrete patio. The simplest design is a firebox and a chimney. The firebox is generally constructed with a smoke shelve (or have a Rumford design) incorporated into the mantelpiece, although straight firebox designs are not uncommon since chimney draft is not always a concern for an outdoor fireplace. Your neighbors calling the fire dept when they see open flames in your backyard, or uncontrolled smoke billowing from your homemade fireplace is a concern. 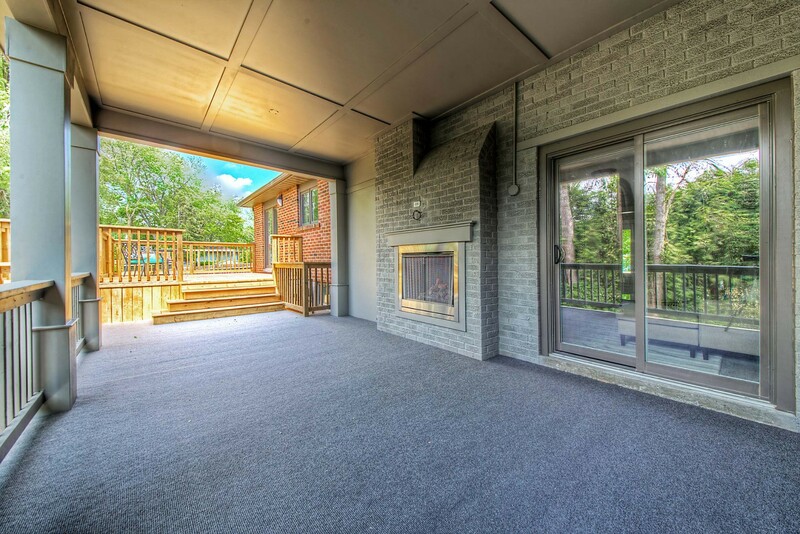 An outdoor patio with a gas fireplace is still subject to municipal restrictions regarding building fires outside the home. This is a common mistake that new property owners make when they first arrive in the suburbs. They make backyard fire pits with flat stones complete with simple chimneys and it usually doesn’t end well. The second-worst case scenario results in an unexpected visit by the local fire department, complete with a hefty fee for their dispatch to a false alarm. The worst outcome is a real and tragic fire that destroys the property. Because of the risks, no matter where you live in Canada, there are bylaws restricting fires on backyard decks and patios, especially suburban lots and on any properties within city limits. Here in Oakville, the bylaw describes a design known as ‘chimineas’ and prohibits them. Although outdoor fireplaces including chimineas can be purchased at retail outlets throughout the city, “open air burning is not permitted unless such burning is used to cook food on a grill or a barbecue and is restricted to a small, confined fire that is supervised at all times.” The fireplace you see in the photos, while it is technically ‘outdoors’, is in fact an “appliance that is in conformance with the Technical Standards and Safety Act, 2000” and as such, it is free of any code violations. The fireplace seen here is a gas burning device that requires no physical cleaning, but there is still seasonal and annual maintenance to be done. Maintaining a gas burning outdoor fireplace is quite a bit easier than a wood burning unit. 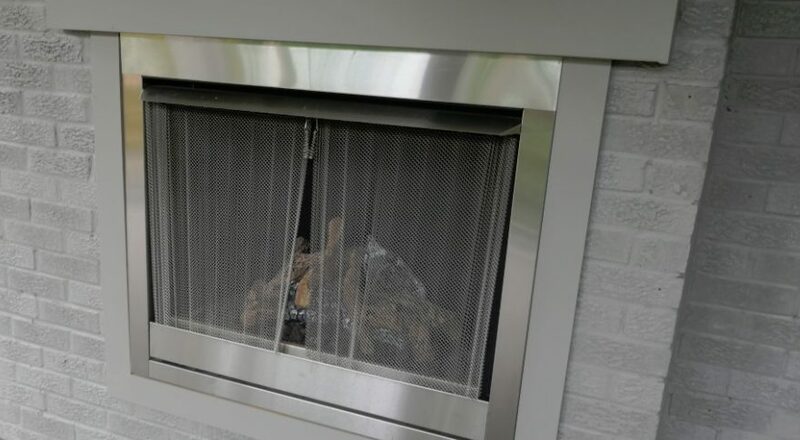 Similar to indoor fireplaces, an outdoor fireplace requires cleaning (in this case that means simply polishing the metal work and occasionally cleaning the glass ) and other minor maintenance tasks to keep it looking and working at its best. The points you see below are commonly neglected by the homeowner, especially if the outdoor gas burning fireplace is used infrequently. Gas lines – The fireplace has gas line that connects to your main gas supply line at the house. Gas lines, turn-off valves and gas fireplace parts require regular maintenance for safety. Any defective parts should be replaced immediately by a licensed contractor. Pilot Lights – Outdoor gas fireplaces have a pilot light that ignites the fireplace burners. If the pilot light is defective or damaged, the fireplace won’t light. Have your contractor inspect the gas valve and gas line for problems and replace the pilot light if necessary. Defective Burners – Gas burners can rust and deteriorate in outdoor fireplaces over time. Located in the fireplace opening, they are somewhat exposed to weather conditions like rain, snow, sleet and wind that can cause them to malfunction. Your contractor should inspect your outdoor fireplace burners on a regular basis to ensure they are working properly. The outdoor space connects at two points and becomes a circle of light through the main floor of the house. The original builders of this quaint split side house in Burlington could never have conceived of how Keith Travers and Eastview Homes have redesigned and purposed its layout. See here this photo showing the home under construction six months earlier. 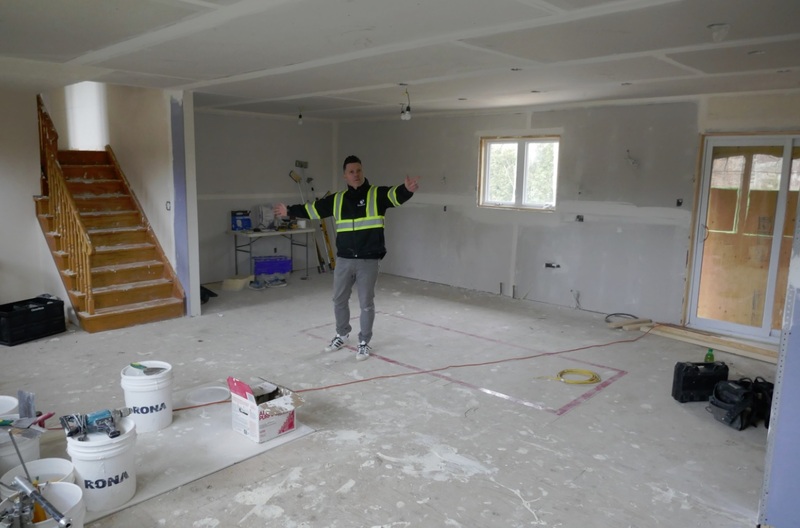 Keith is showing where the walls used to be and standing on the corner of what will be the kitchen island seen below. The backyard patio you see outside here is the exposed east wooden deck beside the covered patio sheltering the fireplace. 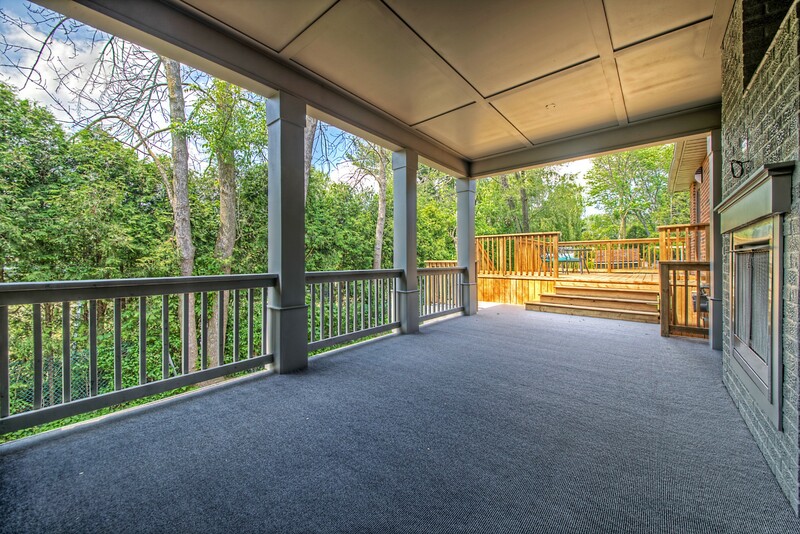 These two distinctly different outdoor decks now connect the house in a circle, effectively doubling its size and giving kids infinitely more space to play (away from parents, but still within shouting distance). The stairs leading up to bedrooms over the garage and front entrance ways are the sure sign of a split side home design common in houses built in the 1960s. 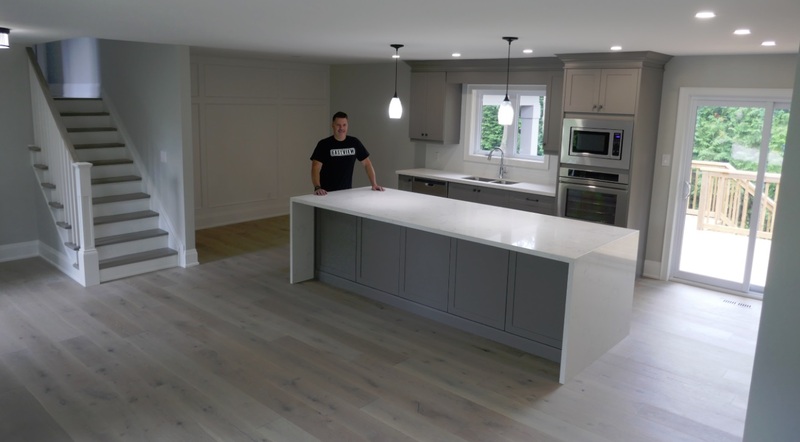 Look here how this kitchen was remodeled; the walls were removed so it can now boast the huge island which is also a breakfast table and homework center. When the family is home the meals can be laid out here in a buffet style and occupants can eat together in whatever room they please anywhere in the circle. In the wintertime, the venue is cut in half on the coldest days. The outdoor fireplace, turned to maximum temperature, cannot heat a space with no walls, and no ceiling insulation. So both outdoor areas become off limits except for people wearing coats and boots for two or three months each year. That is the price we all pay for having beautiful outdoor spaces attached to our homes on lovely temperate days in the spring, summer and fall, all across southern Ontario, Canada.